Commonly known as acid, LSD is an illegal drug that produces potentially dangerous hallucinogenic effects in its users. LSD is a psychedelic drug that is commonly referred to as acid. This is one of the most common hallucinogens and has been widely abused since the early 1950s when it was thought that LSD may have beneficial uses in the clinical field. This psychedelic drug is also known as a hit, dose, microdot or sugar cube on the streets referring to the various methods of which the liquid form of the drug is placed on elements for consumption. 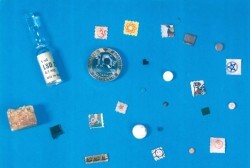 LSD can be found in many forms: liquid, tablets, gel, on sugar cubes, and more. LSD is a drug that is found in ergot, a fungus that grows on rye plants. When the fungus is chemically compounded and manufactured it is made into lysergic acid which can produce a powerful euphoric effect which includes both a body high and a mind high. LSD is odorless and colorless which means that it can be placed on just about any food or drink or anywhere to be consumed. It is often placed on heavy paper with a distinct image on the paper. The paper is called blotter paper and it is absorbent. When divided into pieces and sold individual as “hits” LSD is often named for the type of paper that it is on. No matter how LSD is taken, whether it’s placed on paper and swallowed or dropped into a drink or absorbed through the skin the powerful effects are quite similar. Some users will drip LSD into the eyes in hopes of creating a strong effect and producing more hallucinations but there is no scientific evidence to support this nor is there evidence that suggests such a practice is safe for the user’s eyes. The effects of LSD, like other psychedelic drugs, are unpredictable and dangerous. The effects that a user will experience depend on the individual user, the amount of LSD that was taken, the surroundings of the user while under the influence and the mindset of the user when he or she takes the drug. Most of the effects of LSD will wear off after a few hours of taking the drug but if a user takes LSD repeatedly or for a prolonged period of time the effects of the drug may persist of stick around even when the drug is not being used. Some people report seeing “trails” or visual lines that extend when colors are moved even after they have stopped using LSD. Flashbacks are also a common outcome when LSD has been used repeatedly. A flashback occurs when a user experiences a similar situation in which they experienced while under the influence of LSD in the past. Flashbacks can occur a few days, weeks or even years after the last use of LSD. Although LSD is not considered an addictive substance it can lead to some mental instability problems. Most people who take LSD will not repeatedly take the drug due to the rapid increase in tolerance that develops with each subsequent use of the drug. Generally speaking, LSD will not lead to addictive behavior such as drug seeking or adverse reactions when the drug is not being used. Unfortunately, using LSD can have an adverse effect if you are not careful. Because there are no regulations on the drug that can pinpoint the amount of LSD that is being consumed with each dose, there is no way to regulate how it will affect you if taken. Likewise, the unpredictable nature of the high associated with LSD use makes it difficult to know how you will react from one use to the next. Even people who have taken LSD many times in the past are likely to suffer from adverse effects of the high in certain situations which cannot openly be determined upfront. Like other psychedelic drugs, LSD also has a risk of causing underlying mental instabilities to come to the surface and cause problems for the user. People who already suffer from anxiety or schizophrenia are likely to experience heightened effects associated with these mental illnesses if they use LSD. For some, there is no underlying evidence of the mental instability until the drug is used and symptoms later come out as a result of the drug use—this is where the greater danger tends to come into play.